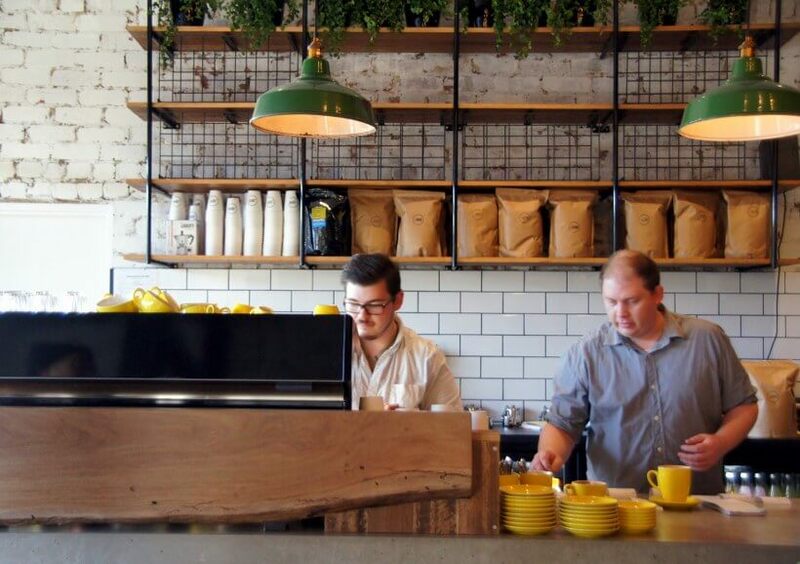 Seddon Village is ever-changing from sleepy suburban strip to hip hangout. This week we said goodbye Seddon video store, hello industrial chic cafe Est. 1906. The large space has been transformed into a funky daytime venue (liquor licence and night trading coming later) which also happens to be one of the most family-friendly spaces I’ve visited in a while. The front dining room is huge, with white exposed brick, a black pressed metal ceiling and pops of yellow in the furniture and the crockery. For those who want some privacy there’s a glass-in room facing Charles Street which is separated by a sliding door. If you don’t have kids this is a great place to hide away! Around the right where there’s another room with more tables and one side that looks out onto the courtyard. This is the least appealing of all the dining areas but it does ok with an awkward space. The courtyard is where Est.1906 really comes into its own. 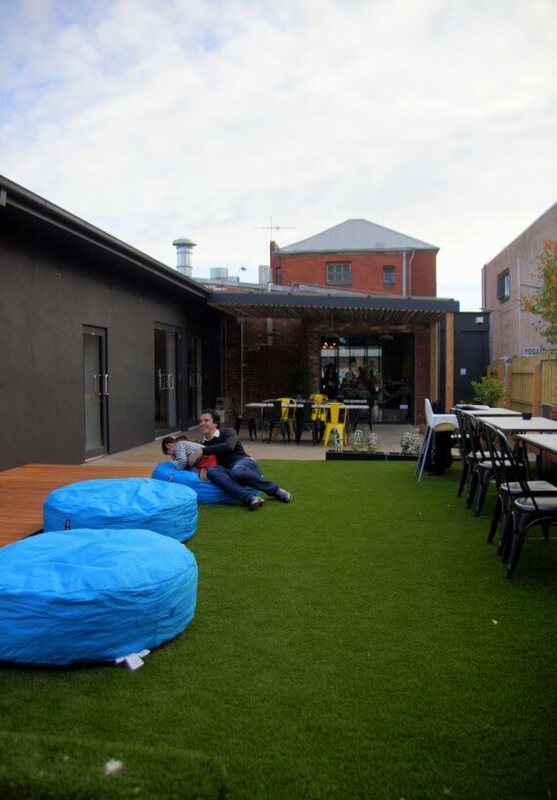 It’s spacious and sunny, with sea blue beanbags upon lush fake grass plus child-friendly elements such as a sandpit and toys. On Monday to Friday the breakfast menu starts at 7am-11:30am, with a rather inconvenient 30 minute gap before the lunch menu starts at 12pm. On weekends the breakfast menu is available all day until 4pm. The breakfast menu is a fairly run-of-the-mill list of cafe standards and in fact the lunch menu looks much more exciting with items such as barramundi and confit duck featuring. 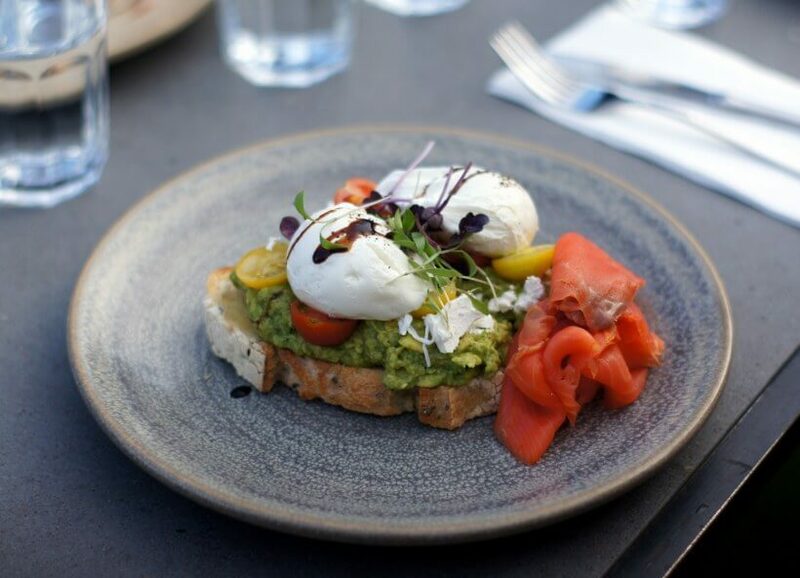 As far as smashed avo goes ‘The Avo’ is pretty good, with generous lashings of avocado with cherry tomatoes, marinated feta, slices of cold smoked salmon and two perfectly poached eggs. It’s comforting and pretty without being thrilling – and probably a few dollars more than I’d expect to pay at $20. The banana bread is a hunk of gently spiced cake with segments of poached pear, a passionfruit half and a dousing of overly sweet honey cinnamon yoghurt. The banana bread is delicious without all the accoutrements and I think solid value at $12. On our weekend visit Est. 1906 was full by 10am so I recommend an early trip. The space is large but there are not enough wait staff when the place is at capacity so the timing can be a bit off – our food came before our coffees and as the place got busier the wait got longer. Our dirty plates were not cleared for a long time. Hopefully these small blips will be ironed out once they settle into their new digs a bit more.